Had some beautiful Java Nut plants I got from Oscar and started from seed, had five in total but one died early due to unknown reasons. Very fast growing and beautiful plants. Recently I moved houses and forgot about them and all the other plants in the greenhouse for quite a while, a while being about three months. All my other plants (inside the greenhouse) had died which included two cherimoya's, yellow jaboticaba, and a mamey sapote, yet still remained the Java Nuts (which were outside for this whole time, where it has been getting pretty darn cold at night!). I was at the old place doing some cleaning and finally decided to rescue them from their misery, and took some photos as well. My friend had stopped by the house a few times and I am sure that they and all the other plants must have been watered while I wasn't there but I know for a fact that they have received not a drop other than what fell from the sky in this past month. From what I can tell, these are some unexpectedly hardy motherf***ers! Tropical Fruit Discussion / How to go about removing comfortable Surinam Cherry (and other) tree(s)? I know that the first step is to get the shovels in the ground but does anyone have any tips for dealing with relocation and transfer shock, as well as the removal for each specific tree in the first place? Tropical Fruit Discussion / Ants: How do I stop the little devils? As I was planting my latest additions to the collection (grafted Norm's Ice Cream Bean, Chaffey Cherimoya, Booth Cherimoya) I had to keep choosing different locations on where to dig because I would keep digging up ant nests. Quite a few of my trees are starting to see a bit of ant traffic and even some scale. I realize tanglefoot could help for the trees but I want to eliminate the problem at the root... or rather nest. What could I use that would keep the ants away or at least in smaller amounts that wouldn't be harmful to the soil fertility or my trees? Citrus Buy, Sell, & Trade / Where can I find plants or scion of any of these? I was pruning and collecting scions from my "Smooth" Surinam today as well as picking weeds, and when I pulled up a mighty soil hogger dozens of sprouting seeds from last season were revealed. I have pictures... only collected about 10 seeds, all had sprouted at least minimal roots and were beginning to stem. Do they usually hold this way? At the end of last season I noticed a bunch of dried seeds under the tree but I did not imagine they would ever sprout, that being said the soil around the tree is very fertile and has a lot of (good) fungi action. Tropical Fruit Buy, Sell & Trade / Selling: "Jack's Smooth" Round/Smooth Surinam Cherry - SEED & SCION. I have been gone for quite a while as I have been swept away by the other love of my life (surfing), as the waves have been good lately (primarily due to El Niño.) All of my trees are in the ground and well, the winter hasn't been too harsh except for some defoliation on an in ground jackfruit. Unfortunately, some of you who were interested in buying seeds and scions weren't able to buy, because I was busy personally, or busy with other orders. Fortunately, the Round Surinam's are coming back into season, the tree has already flowered and will soon be beginning to produce some plump green fruits. In the time since my last post, the tree has also grown a good deal so scions are going to be much more available, if you are interested. CHARGING $21/SCION SHIPPING INCLUDED. US ONLY. PUT YOU ON A PRE ORDER LIST. Tropical Fruit Buy, Sell & Trade / Freshly Picked Smooth Surinam Cherry Seeds- For Trade and Sale! Sorry I've been gone lately, been extremely busy with my new school! I absolutely love it! Anyway, my Smooth Surinam Cherry tree is going off right now, I have to go up to the tree once or even twice everyday to make sure I can get all of the fruit before insects or birds! Fruits are smoother than ever... even less of a ridge on any of the fruits than the first time it fruited. Taste is sweet, and honey tasting as usual. Saving up for a new greenhouse so hopefully I can make part of the cut . Refer to http://tropicalfruitforum.com/index.php?topic=10866.0 for pictures and more information. Im going to put these up for trade and sale. Seeds will be shipped in a moist medium. etc. Send me a pm if you are willing to trade, and what you have to trade. IF YOU ARE BUYING SEEDS PLEASE INQUIRE QUICK BEFORE THEY START TO SPROUT AND BECOME UNSHIPABLE. SEND A PM COMPLETE WITH ADDRESS AND QUANTITY WANTED. I UNFORTUNATELY CANNOT SHIP TO COUNTRIES OUTSIDE OF THE US DUE TO CUSTOMS. Tropical Fruit Buy, Sell & Trade / Does anyone have spare acrylic/plexiglass or polycarbonate panels? I am starting the construction of a new greenhouse soon and have an unfortunate shortage of panels. If anyone has spare polycarbonate panels or plexiglass panels(acrylic panels) and could send them to me that would be awesome. I will cover shipping. Tropical Fruit Discussion / Anyone have a good idea for a PVC pipe greenhouse? I am not sure what to use to insulate the greenhouse (if I decide to build it) but if anyone has ideas please let me know! Tropical Fruit Discussion / Do you use any pesticides? I have found myself growing things completely organic for as long as I can remember. I decided to post this because just recently I am noticing most gardeners I know douse their plants in pesticides when it is not needed. I have a neighbor who lives extremely close to me and uses tons of pesticides when he doesn't even have problems with bugs to start with. I recently purchased a rion greenhouse ( The prestige) and had a very bad experience. It took twice as long as they told us it would take to get here, and then when the first order arrived at least 50 parts were missing. They had us look through every box and check off each part on a list to make sure. We were sure after checking. So then they sent us the parts we needed. Finally the greenhouse was getting built! Then while I was expecting all polycarbonate panels I instead received a mix of mostly cheap thin plastic panels, and some polycarbonate panels, but this was my fault as I had failed to read the full description when ordering. I don't know if I am accurate on this or not but I am having to put large amounts of shade cloth on my greenhouse, only the parts made of the thin, clear, cheap, plastic. Is it possible that these are amplifying the lighting and temperature? Okay, finally, the greenhouse is built! Then on hotter days I begin opening the top window and it works fine. As a continue doing this over a course of months the handles used to open it fell off. I now have to get a large stick and start poking it until I can get it to open. Now, as recently as today, I was opening the door to water my plants, and one of the hinges on the door popped out. Great. I think I am just going to send this one to the dump and build my own greenhouse. I will post pictures as soon as I have the chance. Tropical Fruit Discussion / Annona oligocarpa? 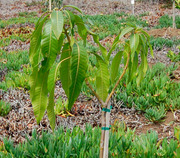 I was recently looking at the endangered plants list by oscar and noticed an quite a few Annona's I have never heard of. I don't know why but I am particularly interested in this one. If anyone has photos, information, seeds or just anything about this species I would be more than delighted. Tropical Fruit Buy, Sell & Trade / Seed List MOST ARE FREE excluding shipping. I have lots of seeds. me know, I have countless amounts of seeds. Starfruit…………….. Not very big fruits, very nice neon yellow color when ripe. lots of seeds so let me know if you want some. That is it so far, but I believe I am going to visit a chocolate farm on the north shore so if I am able to get a good amount of Cocoa seeds( which is highly likely) I will either sell them for $1 a seed or for free. I saw a lot of ripe breadfruit driving through the Koloa village but it was extremely high up in the tree and unreachable by hand. If there is any fruit that you are interested in please send me a message and I will try to find it for you. My Surinam Cherry tree finally ripened around two dozen fruits and I thought someone here might be interested in seeds. I am proud to say that this Surinam Cherry does not have much resin aftertaste, the unripe fruits taste a bit like tomato's and the ripe ones are a lot like honey. Some of the fruits from this tree have no aftertaste but I cannot say that all fruits don't have an aftertaste. Around 50% of the seeds are polyembronic. Tropical Fruit Discussion / Atemoya? Was at a Cherimoya farm yesterday and found a tree that looked different than the other Cherimoya tree's, and was holding many large lumpy green fruits. I think it might be an Atemoya but I am not sure… maybe it is just a Jumbo size Cherimoya producing tree. I have yet to eat it but will post pic's of seeds and flesh and description of the flavor. Tropical Fruit Discussion / Newest Additions to the collection! I also found a grove of very nice Inga's(not sure what species) at Terra Sol Nursery... they were in the private collection but Claire, my friend who works there, said I could have it for $25. 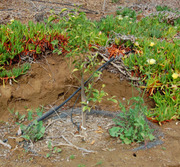 It has huge dark green leaves and the new growth is incredible... bright ruby red that almost glows. Does anyone have an idea what species it might be? The leaves are much more prettier than the new growth on Normans Inga to me. Tropical Fruit Discussion / Fruit tree's with cork? 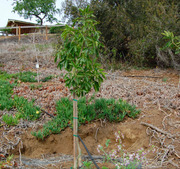 I was wondering if there are any fruit tree's that have cork that is sealed from oxygen and water? I thought it was about time that I post some pictures of my yard on the forum so here they are. The pictures will take place either up on the hill,or in the GH. I don't know how to enlarge the photo inside of a post but you can click the pics for a much bigger resolution. I didn't feel like posting pictures of the tree's that were barren and looked like sticks in the ground so I will leave a list of what I didn't add... I will also add pics of my small seedlings tomorrow. 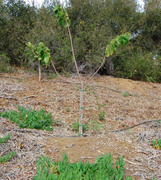 "Normans Early Bearing" Ice Cream Bean tree. Immature fruit of a fig tree that produces extremely large and tasty fruits... it is evergreen... anyone have a guess on the variety? 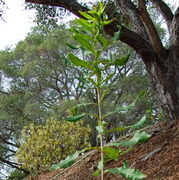 Second Macadamia tree... this one gets a lot more sun and is much smaller. New growth on Rollinia... for a while now the where the Rollinia puts out new growth it suddenly turns brown and then falls off... what is the cause of this because it is in a GH in shade with humidity and regular 75 degree temps... what could cause this? I think it might be rootbound because it is in a very small pot. Seedless Strawberry Guava Fruit... I will post some pics when it is ripe to show it is really seedless. Unknown variety of white sapote that produces fruit all year... these are the flowers. The pretty leaves... I notice the leaves on this tree to be quite rotund and waxy. Tropical Fruit Discussion / Evergreen tree's with pretty foliage... any good idea's? Tropical Fruit Discussion / What the heck is this…? 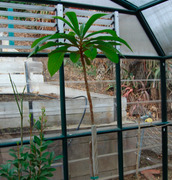 Today I acted like the peach and plum tree's and decided it was spring, so I did some spring cleaning in my greenhouse. I found a bunch of old pots with dried out soil that were about a foot to a foot and a half tall. Well, I emptied one of them and I found a seedling that looked Annonaceaeous… I looked for a seed to identify it better but there was nothing. I remember losing a bunch of poshte seeds from fruit lovers a long time ago in a bag of soil and I used the same soil for these pots so I think that might be it? 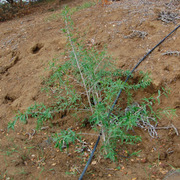 Does poshte have habits look the ones of this seedling? Here's the seedling… it's about 5.5 inches long. The white stem is about 1/8th of a millimeter thick. Click for bigger resolution. And here are the roots, very shallow for the width and length of the stem. Does it look or act anything like Poshte? I thought it might've been jungle sop at first but then realized that if it was I would have found the seed by now… and it would have a much larger system of roots. 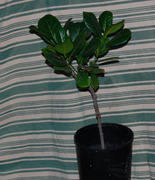 It is currently in the GH in the shade in a long pot with moist sterile soil. Any idea's? Tropical Fruit Discussion / My very first Rollinia! This is my first ever Rollinia, unfortunately not from Norman Beard's tree but that fruit will be ripe soon. It is still not ripe but is beginning it's path from green to yellow. After hearing all the praise for it's flavor I am counting the days until it ripens... lemon meringue pie, huh? I am guessing this is considered "large" for a Rollinia, it is about four times the size of a small Cherimoya. Next to a medium sized Cherimoya for scale. 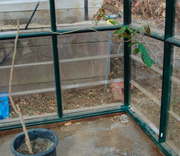 I moved my Rollinia tree into a greenhouse and it seems to have much positive effect, more of the buds are swelling with new growth and I see some flowers on two of the branches. I also tried my first Jaboticaba's today... I was wondering what it tasted like and it tasted very similar to something I had had recently... I realized it was Cranberry lemonade. It tasted just like it, but with a slimy texture and seeds. Mmm, mmm mmm! This wonderful display of fruits come from Norman Beard, there was a grafting thing at his house that I went to and he let me pick a few fruits. I ate those pink fleshed guava's in a heartbeat, the flavor was amazing, although a tad tart. The Surinam Cherries actually tasted good to me, they were sweet this time, I remember tasting them at Ong's Nursery and it tasted like expired soy sauce. Haven't gotten to eating the Cherimoya's yet. The Inga's were the Inga striata I was recently selling, I currently do not have seeds but might this weekend or the next. There are some longans hiding in there too, they are pretty good on a regular basis but they get too pungent for me. Hiding in there is also Red Strawberry Guava and Pink Fleshed Lemon. Tropical Fruit Discussion / First tasting of Soursop, my opinion: AMAZING!!! Wow! What a great experience, the flavor was amazing! It was nothing like Cherimoya, it was kind of like Banana with tart citrus overtones and a little bit of guava! The only thing I would like to change about it would be the texture, it was like a very grainy Cherimoya… every seed inside was viable… I cut open a few that looked suspicious but it was white on the inside meaning it was still viable.